Got on very well with the granny crocheted squares. Made 16 in total using remains of my cat cushion tapestry wool so going to look fab in my sitting room. 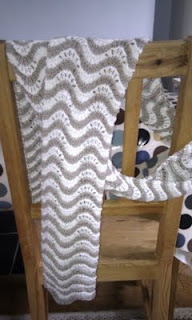 Decided to knit a second narrower lace effect scarf too but ran out of wool. 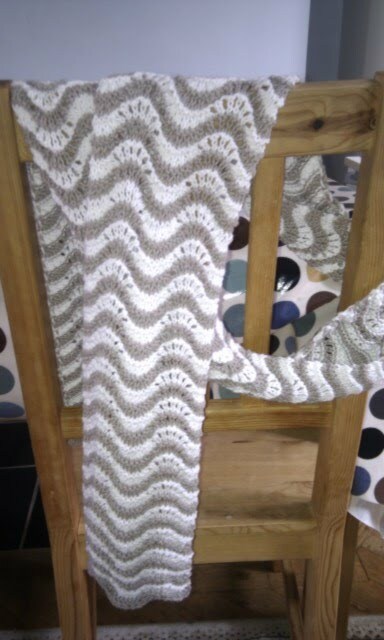 I did notice a pattern for a cute facecloth in Debbie Bliss Eco baby. Knitted another mochimochiland baby gator for my oldest friend who is seriously into all things reptilian. Also tried out some tiny Xmas trees but they just didn't look as they should even when I put beads on them. Ah well will have to rethink on Xmas gifts project. Still have the fuschia bag to make but H is requesting a hat mitten and scarf set in blue. It's still too early to start on winter projects. I have seen some cute animal mitten patterns knitted in the round... well enough rambling on for today.